Hello, citizens of Tyria! I’m Link Hughes, and today I’m pleased to tell you how your guild can claim a guild hall for its very own. 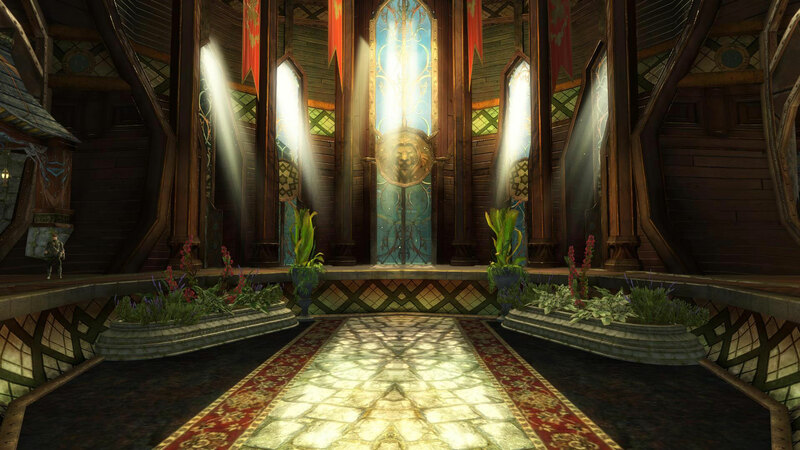 Obtaining a guild hall isn’t as simple as buying one from a merchant; the process of acquiring it is one of the most concrete examples of how we’re making guilds a greater part of the world of Tyria. With the Pact in tatters, Tyria’s governments have had to scramble to figure out new methods to address the continuing threat of the Elder Dragons. 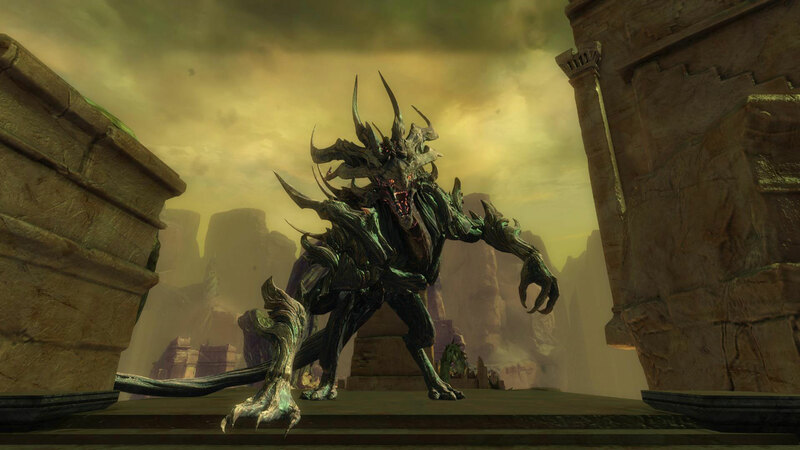 In light of the past successes of guilds like Destiny’s Edge against the dragons and their minions, Tyria’s authorities have decided to enlist and mobilize existing guilds against the dragons and other substantial threats. The Guild Initiative is a new organization that will set up its headquarters in Lion’s Arch and begin registering guilds for the cause. They’ll provide registered guilds with access to their facilities and support staff, as well as assign missions for those guilds to complete to maintain their fitness and contribute to the general welfare of Tyria. Furthermore, the Initiative is conducting active research to find new technologies that will benefit guilds in their efforts, such as a new mobile portal and a powerful assembly device that can assemble tools from raw aether according to schematics. Finally, the Initiative is pursuing large-scale reconnaissance and exploration to identify activity and movement of the dragons’ minions. Once your guild is registered with the Guild Initiative, you’ll gain access to their new headquarters in Lion’s Arch. We’ve used new technology to make the Guild Initiative Headquarters an instance that is shared by you and your guild members. While the Initiative Headquarters is not a full guild hall, it will provide access to existing features that we’re moving out of the guild panel for those guilds that do not upgrade to the expansion. Inside the Guild Initiative Headquarters, you’ll find explorers who have scouted out particularly large infestations of Mordrem in remote ruins in and around the western jungle. Given the incongruous concentration of Mordrem in these locations, they’ve been determined to be of strategic importance to Mordremoth. The explorers are seeking guilds willing and able to mount expeditions to liberate these ruins, and Tyrian world governments have agreed to cede ownership of the ruins to successful guilds so long as they maintain a presence in those places and defend them from recapture by the dragons. Mounting an expedition to take one of these ruins is an expensive proposition and requires a certain amount of trust from the Initiative. On top of the costs to supply a population of Initiative guards and support staff to help settle the location once it’s been taken, your guild will actually have to reach the ruins, which is an adventure in itself. Once there, you must go in and drive out the Mordrem. At the heart of the ruins, you’ll discover a strange crystal embedded in the earth that was the focus of the Mordrem’s attentions. The crystal shines with magical energy, and it seems the creatures were drawing power from it to feed to Mordremoth. When one of your guild leaders touches the crystal, they can attune it to your guild and cut off the jungle dragon’s influence. At that point, you’ve officially taken your guild hall! In the next post, we’ll look at how your guild can go about building up the hall itself once you’ve taken it.